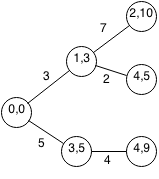 Bellman Ford is an algorithm that finds the shortest path from one source node to every other node in the graph. The running time is O(n2) and is able to find negative cycles. Bellman Ford can be done using backtracking to find the shortest path in a graph. We first start at the starting node with a starting cost of 0 and 0 edges used. For each node thats connected to that node, we repeat and add to the cost of the node. 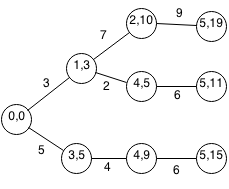 We will do an example of the Bellman Ford algorithm on the above graph. At each node we have the node index and the current weight to reach that node. We start at node 0 with a weight of 0. From node 0, we can reach node 1 and node 3. At node 1, we have an accumulative weight of 3. At node 3, we have an accumulative weight of 5. From node 1, we can reach node 2 and node 4 with respective accumulative weights of 10 and 5. From node 3, we can reach node 4 with an accumulative weight of 9. From node 2, we can reach node 5 with an accumulative weight of 19. From node 4, we can reach node 5 with an accumulative weight of 11. From node 4, we can reach node 5 with an accumulative weight of 15. Let bellmanFord(target,n,w) be the shortest path from the source node to the target node using n edges and cost of w.
We can rewrite this solution using dynamic programming to be more efficient. // Let dist[i] be minimum distance from start to i. // Maximum path to take is n-1 steps. // Iterate through neighbors of the node. // Only visit node if path is defined. // If new dist < cur dist or not used, then update node. // Check if negative cycle exists. // Check if edge can create negative cycle. // Check if no path exists. Notice that 1 USD -> 1.12 CAD -> 1.008 USD. Bellman Ford can be used to find methods of arbitrage by using the vertex as currency and edges as transactions, and the weight as the exchange rate. All that is needed is to find a path that maximizes product of weights and finding a negative cycle. Write a program that detects a path for arbitrage to occur.